Monday, November 26, 2018 • 6:00 p.m. This presentation is free and open to all members of the public. In the wake of last summer's historic flooding, John Reimer, Assistant Director of the Dane County Land & Water Resources Department, will give a public presentation on how the levels on the Yahara chain of lakes are controlled. Mr. Reimer is responsible for lake level management, including aquatic plant harvesting and operation of the three dams in the Yahara chain of lakes. He'll explain what contributed to last summer's historic flooding, why managing lake levels is difficult, and what is planned to improve control of lake levels in the future. He'll also discuss new initiatives the County will include in its 2019 budget proposal to aid flood recovery, increase lake health, and build future resiliency. $70,000 that would go to the Madison Community Foundation – Dane County Immigrant Assistance Fund. This organization assists immigrants in our community. $80,000 for a second position in the Dane County Immigration Affairs office. Currently, there is only one social worker to do caseload management. This was a lot of work before ICE stepped up activity in the area, but now there are even more families relying on Fabioloa Hamden. Support for Neighborhood around La Follette High School. I have been meeting with school employees, students, and residents. Each group has expressed concern for recent gun activity, and youth violence. We are looking at reserving funding for a position, and community engagement that will influence how to move forward. Parent Training for Inmates. I serve the Creating Economic Stability Team at the United Way, and the Journey Home Delegation. This has introduced me to a lot of information and experts on corrections. I recently learned about an evidence-based program that helps parents in prison connect with their children. It helps them build tools, as well as dealing with the stigma of an incarcerated parent and trauma of separation. The training costs for 3 people will be around $6,000, and the work will be completed in partnership with UW-Madison researchers. Monona. I put in a request to the Monona Mayor O’Connor late in the process. One of the benefits of knowing this process next year, is that I will start much earlier with my community requests! She is reaching out to staff and will get back to me with possible budget support for Monona. Vets Ride With Pride. During my Veterans Service Commission meeting, I learned that this program is critical not only in helping Veterans get around to important appointments, it is also a chance for staff to check in with Veterans and look for signs of mental and physical health concerns. A confirmation from the County Executive’s office informed me that the $10k increase that was added to the budget. Kajsiab House. This effort was led by our committee chair Jamie Kuhn, and I was grateful to be alongside her to help where I could. We will have an amendment that helps keep the doors open through 2018, and allow for a proper transition for culturally competent mental health care. Us new folks are all excited to go through our first budget! We start analyzing what was funded and looking for where we might suggest amendments. Land Information Council. We had an open data win recently. All of Dane County’s spatial data will be openly available. Engage Dane. A group of us researched how to better engage with people who don't typically contact government. I participated in four listening sessions with different groups around the city, including South Madison Planning Commission, Latino Support Network of Dane County, Area Agency on Aging, and the free community meal at First United Methodist Church. We collected the results and made recommendations on how to move forward. I look forward to continuing this work. Flooding. The flooding was rough and we are not out of the woods. The recent rain has undone all of the progress we had seen over the last several weeks. I have attended a handful of meetings with the Director and Assistant Director of Department of Land and Water. The county passed a resolution which you can see here, to look at the trends, given the changing climate. Listening sessions tied to the task force approved in the resolution will be scheduled as part of the process, and Mayor O’Connor is coordinating an additional presentation. I will update when I have more dates. On Thursday, Sept 20, there will be a committee of the whole meeting. You can read more about that here. 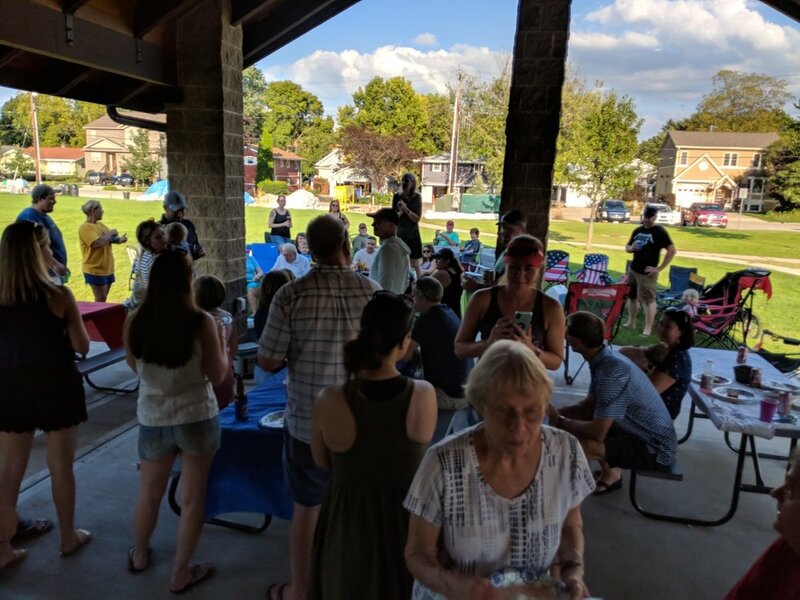 Last weekend, I attended the Belle Isle Neighborhood Association potluck where I heard from many of you about concerns and questions you have. I knew some of them, and some of them I need to ask of the experts. I have compiled your questions below. I have shared this with County Staff, and committee members who have been working on these issues, so that they can address them during the presentations. If you have any other questions that you would like answered, please reach out to me: buckingham.tanya@countyofdane.com. Also, remember that you can livestream the meeting, and save yourself a trip to the City County Building. The link to livestream seems to be down as of tonight (Wed, Sept 19). If that is still the case, watch my Dane County Facebook page for updates. What is the plan to deal with flooding in the future? Is the control and lowering of Mendota permanently as the control lake going to be addressed? It seems that the handling of our lakes is very reactive, rather than proactive. Can you say a bit about how the decisions are made with regard to the level of the lakes? It seems that the lakes are rarely at the low level to start the winter, what impact does it have if the lakes are high before the freeze? Why are the current lake levels, specifically summer maximum levels, for Lakes Mendota and Monona not adhered to, followed or enforced? And who is responsible for enforcement? I would like to better understand what concerns there are regarding a potential failure of the Tenney Lock Dam. Some areas of concern are the following: a) are we worried about erosion around the dam, b) a mechanical failure of the gate, c) something else, and d) is there an emergency plan in such an event? There was recent maintenance a year or two ago. What was fixed then? Are there plans to somehow shore up the lock and dam or other preventative measures being taken to avoid this catastrophe? What additional infrastructure is needed to make sure that there is no bottleneck of weeds at the narrow parts of the chain of lakes? How is runoff in the north being dealt with to mitigate blue-green algae? Does slow-no-wake play a role in blue-green algae? Why has the health of the water deteriorated so drastically in the recent past? What can be done about it? Can you explain why the lake debris that I collect is not regularly collected? Why is Lake Mendota managed as a trophy lake with reduced bag limits which greatly increases fishing pressure, fishing tournaments and boat traffic on the rest of the Madison chain of lakes. Should they not be managed in an equitable way so that all of the lakes receive the same pressure? Responding to flooding in the Yahara Lakes watershed, the Dane County Board is meeting as a Committee of the Whole to hear from County lakes experts and find answers to questions about the Yahara watershed. Additionally, a resolution that will be introduced at the Board Thursday calls for convening a group of experts to evaluate the situation and make policy recommendations by March 31, 2019. Those recommendations could include petitioning the state Department of Natural Resources to allow lower lake levels in the near-term and consider longer-term changes. The county is responsible for maintaining water levels for the four major lakes in Dane County: Lake Mendota, Lake Monona, Lake Waubesa and Lake Kegonsa, mainly through operation of the Tenney Park Dam. But any permanent changes in lakes levels must be approved by the DNR. The current target range of keeping Lake Mendota water levels at 849.6 feet above sea level was set in 1979. 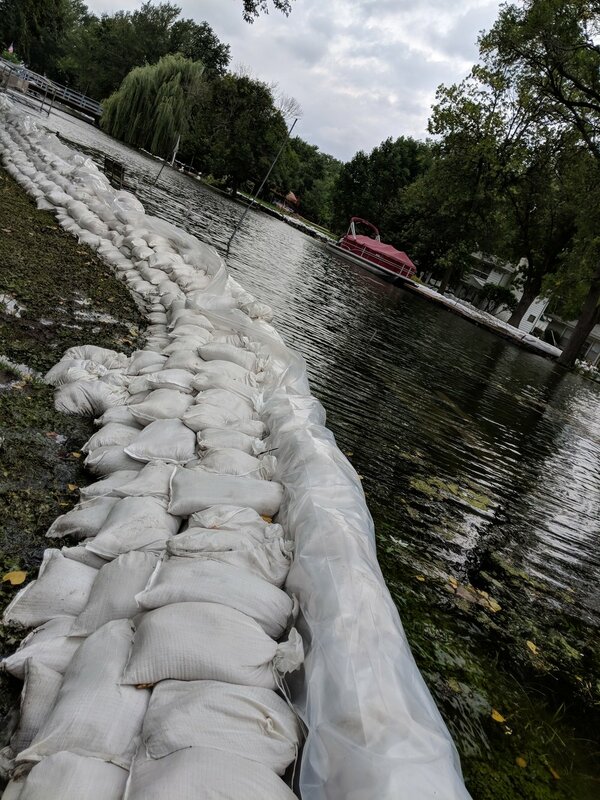 Supervisor Yogesh Chawla (District 6, near east Madison) said he has seen the effects of the flooding first-hand along the Yahara River and Lake Monona. "This resolution will help Dane County bring our lakes down to their state allowed minimums in the short term,” he said. “It also provides a framework and timelines for a robust process to determine what the proper lake levels should be given a rapidly changing climate." The resolution calls for the Land & Water Resources Department to prepare background material for the Lakes & Watershed Commission and the Environment Agriculture & Natural Resources Committee by immediately convening a technical work group that includes representation from the University of Wisconsin and other experts. The group would evaluate conditions, model various scenarios that include predicted climate changes, identify short- and long-term recommendations to improve resiliency for future flooding events and make other recommendations that may include petitioning the DNR to change the permitted target range for lake levels. Supervisor Chuck Erickson (District 13, near west Madison) serves on the Lakes & Watershed Commission and said he is looking for a long-term assessment of the situation. “While lowering the lake levels is a good place to start, we need to closely review the impacts on the flow required to move water downstream and the impacts on the environment,” he said. Also Thursday, the Board will view a presentation of "Minding the Gap: The Housing Crisis in Dane County." Produced in conjunction with the Dane County Housing Initiative (DCHI), the video documents the challenges facing those who struggle to meet monthly rents despite working full-time or receiving retirement benefits including Social Security. According to a recent report, over 22,000 low-income households in the county pay more than 30% percent of their income in rent. Another 12,000 very low-income households pay more than 50% of their income in rent, with 2,200 of those seniors. To help close that gap, the board will consider providing $500,000 to developer Gorman & Company to assist with the “Grand Family” affordable workforce housing project at Union Corners. Located at 2507 Winnebago St. on Madison’s east side, those units are aimed at families or seniors caring for younger children. In addition, the Board on Thursday will consider transferring $15,000 in unused funds from the Planning & Development Department budget to the County Clerk's Office to facilitate the completion and execution of the voter ID education plan. The goal of the campaign is to inform voters of the ID law, direct voters to the statewide helpline and/or microsite where they can get assistance or a ride to obtain an ID and promote a culture of voting. On Thursday at 6pm there will be a Committee of the Whole meeting. This is a special meeting called by Board Chair Corrigan to inform the entire County Board of the status of the lakes, flooding, and the commission’s work. Supervisors will have the opportunity to ask questions of the commission. Please share this, and contact me if there are questions that you would like answered: buckingham.tanya@countyofdane.com, @tanmabuck (twitter), @SupervisorBuckingham (facebook). In addition to this special meeting, there are plans to have meetings within communities that have been impacted by the flooding. Staff will be in attendance and you will be able to pose questions to them, and make your voice heard. As soon as that date is announced I will share it with you. The Lakes and Watershed Commission has been invited to attend and ask questions of the presenter(s), agenda here. You will be able to livestream the meeting here. It has been a very busy several weeks, so this is an overview of everything that has happened around District 24, the County, and with the boards and commissions on which I serve. As always I am available to talk about what is important to you, or things that you’re thinking about. 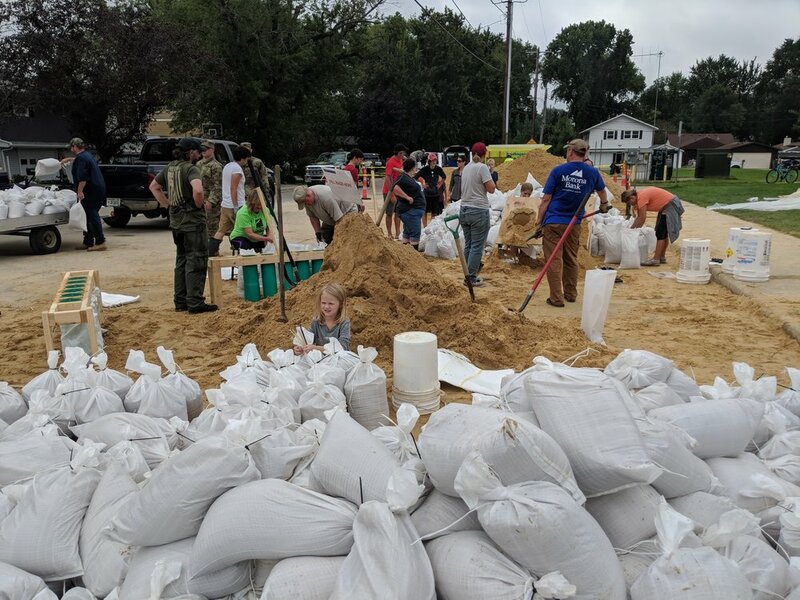 There are two major issues that we’re looking at right now: response to flooding and the 2019 budget. If you have anything you’d like to share with me, please reach out to: buckingham.tanya@countyofdane.com. I am three months into my term, and I have a learned a lot. The last few weeks my focus and work has been spent in three areas: Buckeye Road, immigration, and corrections. The information provided here is a summary of the activities during the month of July. At our Health and Human Needs committee meeting in June, Fabiola Hamdan the Dane County Immigration Affairs Specialist joined our meeting to present the work she is doing. I met with her the following week to learn more about how to support immigrants in our community, and have had a handful of meetings since then. On July 24th, I attended the press conference hosted by Voces de Frontera, where I heard about two Wisconsin residents dealing with the tragedies of deportation and detainment, and how destructive they are to families. Below are the videos from the press conference. The following three videos answer the question, "What can I do to help?" Engage Dane is an ongoing project envisioned by Board Chair Sharon Corrigan to improve communication between elected officials and local residents. July 9th, I kicked off the listening sessions with the Area Agency on Aging which is an organization for adults 60 and over who would like to stay in their own homes. As part of the Engage Dane project, I also visited LaSup, Latino Support Network of Dane County, with my colleague, Supervisor Stubbs on July 18. July 10th, Vera Agency celebrated community by hosting the annual Baseball and BBQ event. 300 people who love, work for, and participate in programming at Bridge LakePoint Waunona Neighborhood Center, Vera Court Neighborhood Center, and Latino Academy of Workforce Development attended the cookout and Mallards baseball game. On July 11, I visited Oakhill Correctional Institution, a State of Wisconsin Department of Corrections facility, in Oregon with the Journey Home Delegation of the United Way. We visited several buildings, learned about educational, and job training, and had a chance to speak with three inmates. The Journey Home Delegation is part of the Building Economic Stability team, and we met in a combined meeting with the Academic Success team of the United Way to discuss overlap in missions as it relates to GED and HSED on July 20th. Four County Supervisors and three Madison Alders have been working together to reach a plan on Buckeye Road & Cottage Grove Road. You can read more about it here. The City Finance Committee will consider the resolution on Monday, July 30. Please attend and voice your opinions about this project. My colleague, Supervisor Kilmer invited me to tour of Journey Mental Health with him on July 13th. I'm grateful for his mentorship, and collaboration. It was very helpful to see all of the services that Journey offers, and the way they are thinking about mental health care. We toured the facilities, and learned a lot about how they are incorporating physical health care into mental health care. Sunday, July 22nd, I joined Monona Mayor O'Connor at the Farmers' Market for office hours. I heard about some concerns with lake "junk" and "gunk" and many folks just stopped by to catch up. If you are interested in stopping by to talk please visit us on August 19th. We made some time for family over the last month as well, with All City 2018 hosted in Monona this last weekend, it was busy throughout the city. All City is a really wonderful event, where any child who is part of a team in the league gets to swim. 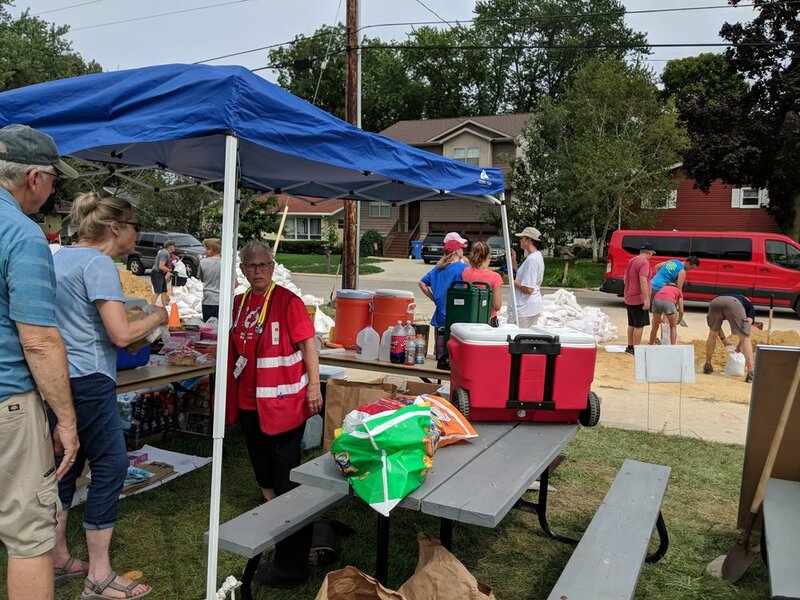 There was a major Zero Waste initiative led by Teresa Radermacher this year that included a construction of a water station by the Monona Public Works which significantly cut down on the use of disposable plastic water bottles. We also had a chance to get to the Dane County Fair. We walked through the animal barns, tasted some food, watched some performances, and enjoyed a couple of rides. The weather was cool, making for a delightful afternoon! I feel really lucky to have the opportunity to spend some time hanging around the neighborhood parks, visiting campus, and the Children's Museum. 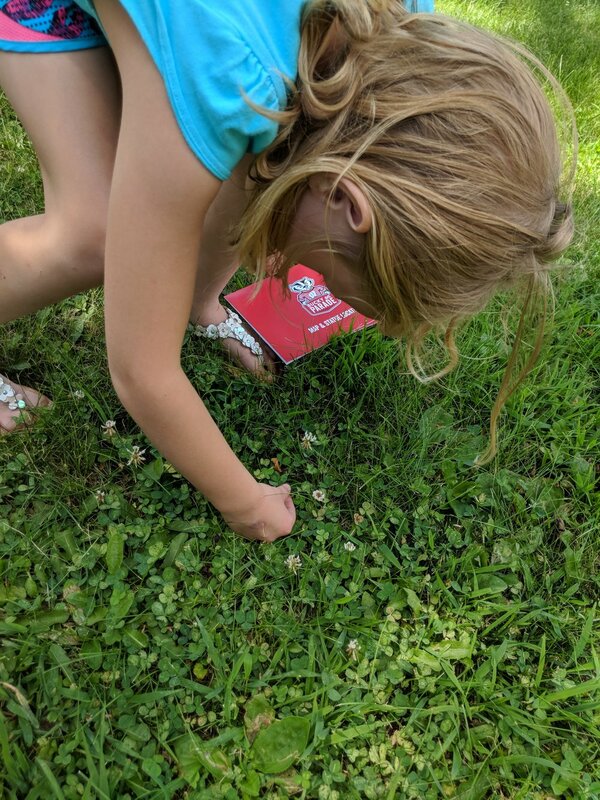 My little one even felt so inspired by my friend Gabriella Gerhardt's four-leaf clover exhibit to do a little hunting of her own! You may have noticed that I am a little behind in my weekly updates. This is largely due to all of the work that has been happening! Besides my standing committee, and normally assigned commissions and boards, a group of us has been working to find a way forward with Cottage Grove Road and Buckeye Road. City Alders David Ahrens, Mark Clear, and Amanda Hall joined County Board Supervisors Kelly Danner, Jamie Kuhn, Jeff Pertl, and myself, in collaboration with Executive Parisi and county staff, came together to work out a solution we felt was acceptable to each entity involved, and achieved what we all wanted which is to have Cottage Grove Road and Buckeye Road repaired and improved for the community. Resolutions were introduced to both legislative bodies today, you can read the press release here. Shared goals are to address the substandard road condition, lack of sidewalks, improvements to pedestrian safety, especially adjacent to Allis Elementary School. Dane County agrees to financially support the construction projects on County Highways AB (Buckeye Rd.) and BB (Cottage Grove Rd.) under the standard cost-sharing agreement. City of Madison agrees to accept responsibility for routine maintenance of the roadways, including snow and ice control and pavement patching, while the County agrees to forgo the jurisdictional transfer of both road projects at this time. From here the decision will lie with the Madison Area Transportation Planning Board (MATPB), which will vote the first week of August as to whether to remove the Federal funding from these projects and reallocate it to other projects. I am especially grateful to Supervisor Pertl for his leadership in this process, and Alder Clear's long-time service to the MPO, having served 10 years, and providing important perspective of transportation and planning. I am incredibly thankful to our counterparts at the city for always being willing to sit down and talk about how to achieve a shared goal, while working through some big challenges. Please feel free to reach out with any questions. This has been an extreme learning process for those of us new to transportation, and we would be happy to share any information with you. SPECIAL POST: Public Meeting tonight, Buckeye Rd. & Cottage Grove Rd. If this topic is new, you can see news coverage here. A few weeks ago, we began working with area alders and supervisors, the County Executive as well as County and City staff to resolve concerns regarding the proposed jurisdictional transfer of County Highways AB (Buckeye Rd.) and BB (Cottage Grove Rd.) from the County to the City. We have made significant progress on this issue, with the County advancing multiple proposals (including the original position advocated for by City staff). Unfortunately the Mayor has rejected all of these proposals, instead advocating the Madison Area Transportation Planning Board transfer the funds to cover federal funding shortfalls in other projects. Negatively impact neighborhood families, particularly those enrolled at Allis school. Our top priority has been addressing the road condition, sidewalks and other improvements around Allis School. The nearly 500 students enrolled at Allis are 77% students of color, 67% low income, 25% English learners, and 14% special education. These students and their families deserve a road that meets urban standards around their school. Additionally, both the County and City have spent years planning these projects and committed over $2 million to planning, design, and property acquisition for these projects. Given the time and resource investment, it would be imprudent to abandon these projects at this time. Transferring this funding strips communities on the eastside of funds needed to reconstruct roads that are in poor condition and do not serve the needs of the communities. In the alternative, we find it critical that local leaders are open to compromise and reach a mutually acceptable agreement. Most of all, in the end we remain committed to moving forward, working together, and investing in these critical neighborhoods. As such, we ask you as neighborhood and education leaders in our community to urge the Madison Area Transportation Planning Board to deny or delay this request until the regularly scheduled meeting on August 1, preserving our ability to continue working together in good faith on behalf our neighborhoods and families with school-age students. Thank you for your work on behalf the kids and families in our community. This update will be a little longer because we have a lot of catching up to do! I spent two weeks on a research trip to Sicily to map ruins in Agrigento. I'll begin with the most urgent message which is regarding immigration. The day after I returned to Monona, the Health and Human Needs Committee met. We heard from county staff about mental health services and immigrant support services. We are hearing a lot in the news about the way the federal government is treating people, but we are not getting enough information about what is happening in our own community. I will work with county staff to bring more of that information to you. In the meantime if you, or anyone you know is in need of assistance related to immigration issues, please reach out to Immigration Affairs Specialist, Fabiola Hamdan, hamdan@countyofdane.com, phone: 608-242-6260. For a list of Dane County resources with links, visit here. It was while I stood in front of the Temple of Concordia, and watched the sun illuminate the east facing side—the same sun, on the same pillars that have stood for more than 2000 years—that I felt deeply connected to the chain of human existence, and was reminded of the weight of our responsibility to do the most we can with the time that we have in our lives, as that chain continues into the future. The meeting agenda for the June 28 Health and Human Needs Committee can be found here. We met at Badger Prairie Health Center, a state of the art facility that is prepared to provide difficult health care to the most challenging illnesses. June 14, Health and Human Needs held a short and insightful meeting, with presentation a presentation from Martha Stacker, Children Youth and Families. You can find the meeting agenda here. We then joined with our colleagues from Public Protection & Judiciary Committee, where we heard from Jacob Cirian at The Grow Academy, and John Bauman on the current and future of juvenile corrections in Dane County, as we walked through the juvenile detention center, joined by many members of MOSES. On June 12 the Dane County UW-Extension Committee met, agenda linked here. We shared the biggest struggles to Dane County and the greatest opportunities. Supervisor Danner drafted a letter to Governor Walker demanding that he rescind the order for Wisconsin National Guard to travel to the southern border. Read it here. Thanks to the Dane County Immigration Affairs Specialist, part of Dane County Department of Human Services (DCDHS) a list of resources has been compiled for you or anyone you know who needs support regarding immigration. Please see the list below, and share broadly to support our neighbors. Contact Immigration Affairs Specialist, Fabiola Hamdan, hamdan@countyofdane.com, phone: 608-242-6260 if you need assistance. Also, if you want to help, you can donate, additional resources are greatly needed. I have been in Sicily for work to do some mapping of classical Greek and Roman sites. Next week the weekly update will return with all of the happenings at the County, including Health and Human Needs, and UW Extension committees, as well as some additional commissions that I'll be working with. While I've been away, I have checked in with a few constituents who are impacted by high water levels to see how they are managing. Additionally, I've kept in touch with county supervisors and staff who are working on a solution to Buckeye and Cottage Grove Road. I attended an event that celebrated the 99th anniversary of the ratification of the 19th Amendment, hosted by team19. Many familiar local leaders spoke, including Madison City Alder, Arvina Martin, Wisconsin Women's Network board members, Bianca Shaw and Karen Meulendyke. We toured Madison South Health Center of Planned Parenthood this week, where we learned about education programs, testing, and vital health services offered to men and women throughout the state of Wisconsin. You can watch the full June 21 board meeting at City Channel, agenda to be found in legistar. As always, please feel free to contact me to let me know how you feel about items on the agenda or follow-up with questions. Supervisor Stubbs introduced a resolution to honor the work of Michael Johnson, president and CEO of the Boys & Girls Club of Dane County. The County Executive recommended the Chapter 15 appointments, which will require approval from the County Board. I am slotted to serve the Land Information Council, where I look forward to active conversations about access to data, and learning more from the talented staff. As a family we closed out the school year, and welcomed a first and seventh grader into the house. I was able to join on a field trip to the Henry Vilas Zoo, Wisconsin Aviation, and Cherokee Marsh where members of Madison Audubon Society led activities for the kids. We enjoyed soccer and the first Monona Swim and Dive meet at Seminole Pool. And, we spent many hours listening to my daughter prepare for a WYSO audition. It was a busy week, and a long weekend with both family and county events. For that reason, this week I will only include a summary of the week to start, and will add the "in other news" section within in the week. I am still pursuing action on the Dark Store Loophole legislation. Re-inspired by Representative Shankland, AD71. I have been learning from Supervisors Kolar and Nelson, Board Chair Corrigan, about what the county has done. If you're new to the loophole is new to you, in a nutshell: Big box stores are refusing to pay their fair share of taxes which means home owners and small businesses will have to pick up the slack or lose access to important services. The legislature is in a position to close the 'Dark store' loophole which allows national chains to pay property taxes equivalent to that of an empty store. On March 27, 2017 the County Executive signed a County Board approved resolution urging the governor and state legislature to close the loophole. The Dane County Board is considering a countywide referendum that would allow voters to convince state legislators to close the loophole. 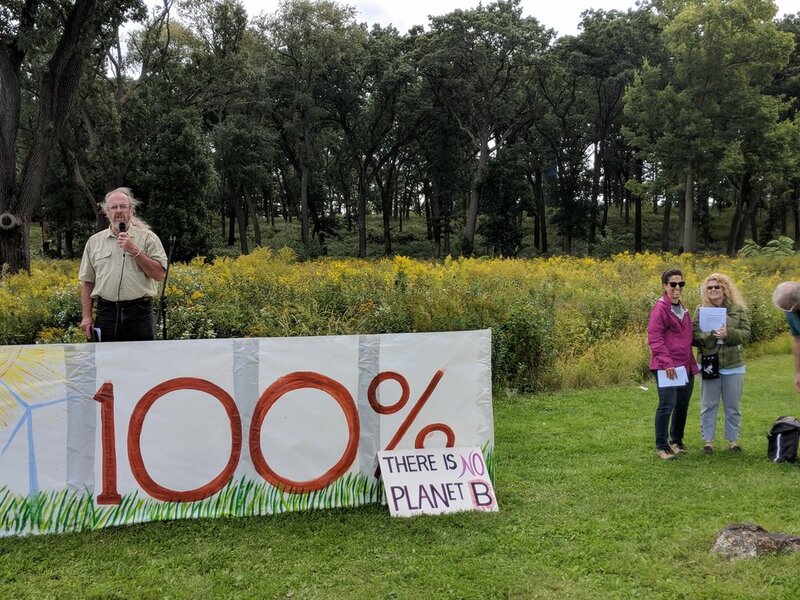 Brown and Outagamie counties are hoping to put pressure on state legislators by asking residents to vote on the issue. Several months ago, many concerned residents gathered at the Monona Community Center to express their concerns about the Big Box Stores move to skip out on their taxes. This group is still working to do what it can to move the message forward. Please reach out to let me know how you feel about the Dark Store Loophole. On Monday, we marched to honor those who have given their lives in defending the country. We were joined by friends who helped us connect with residents in the parade. Following the parade we joined the celebration at Immaculate Heart of Mary Backyard Bash. On Tuesday, I was able to attend an informative session on the importance of apprenticeship programs, like those in Germany. Kassel-Dane Sister County Partnership event, "Overcoming Workforce Challenges in Manufacturing"
Wednesday was packed with the Moxie Conference during the day, an event that the Dane County Board was a sponsor. I ran into many friends there and reflected on the importance of all inclusive workplaces. Wednesday evening, I attended the MG21 Graduation where I heard stories from incredible students who have overcome what they believed at one time to be insurmountable obstacles. I left feeling deeply inspired from these young people. Congratulations to all Monona Grove students who celebrated graduation today, and to La Follette students who will celebrate this coming Friday. 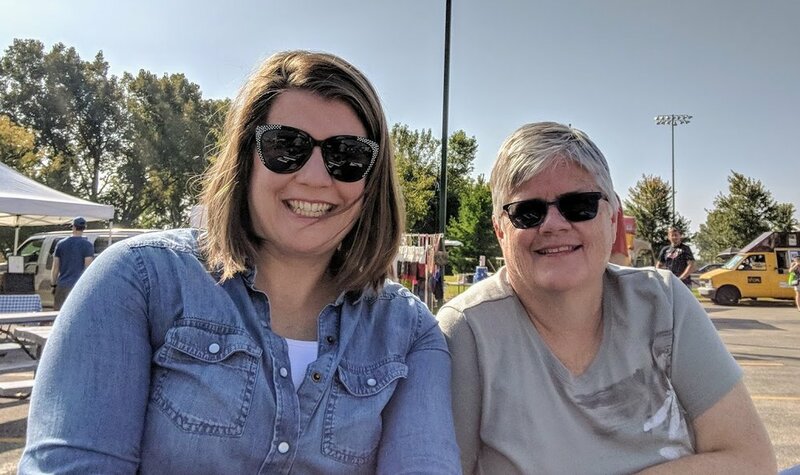 At Bridge LakePoint Waunona we celebrated the conclusion of the school year as the staff prepares for the summer sessions with the annual picnic. One of the cutest graduations around! The Los Niños Primero participants graduated this week. The Los Niños Primero program provides Latino children ages 3 to 5 with developmentally and culturally appropriate preparation for 4K/Kindergarten and long-term academic success with quality, research-based early childhood education and family support. Parents are active participants in the program helping their children gain preparedness for academic success. Hats off to all of the organizers of the Dane County Parks Unite Festival. The event celebrated the connection, via a footbridge, of two parks, one in Madison and one in McFarland. There were pontoon boat rides, science fun, tree climbing, good food, circus training, hula-hooping, disc golf, mural painting and more! We spent hours exploring all of the activities -- the event was such a success in bringing people together. I ran into several friends, and neighbors—some people I hadn't seen in years! I hope you were able to make it out. This morning I joined Monona Mayor O'Connor at the Monona Farmers' Market for office hours where we chatted with residents all morning. It was a beautiful morning to be outside hearing about what matters most to residents of Monona/east Madison. 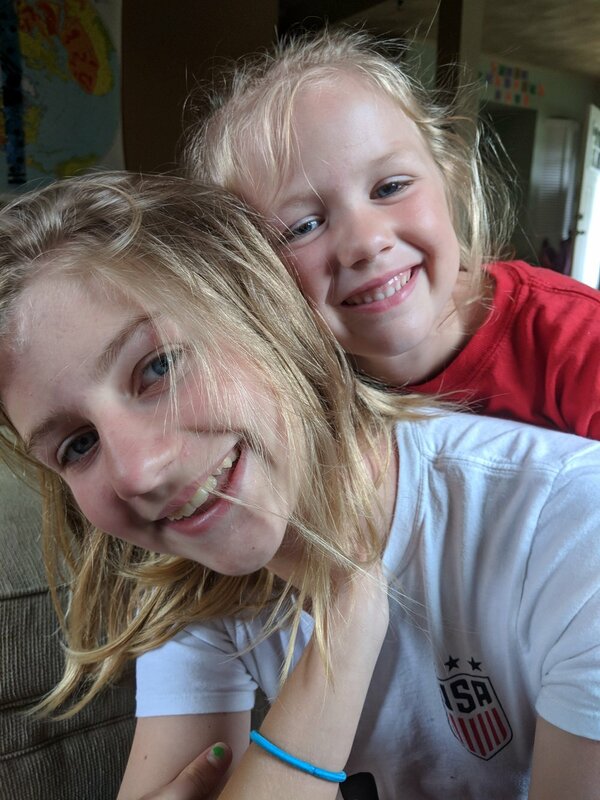 As a family we took in a lot of soccer this weekend, a cello recital, swim team practice started, and we joined family in Oxford WI for a get together. A full week, indeed! In less important news, if we meet around town, I did chop off 13 inches of hair. It will be making its way to Locks of Love along with donations from my two girls. I've caught some people off-guard this weekend when I've been out and about -- if we meet, yep, it's me with a little less hair! 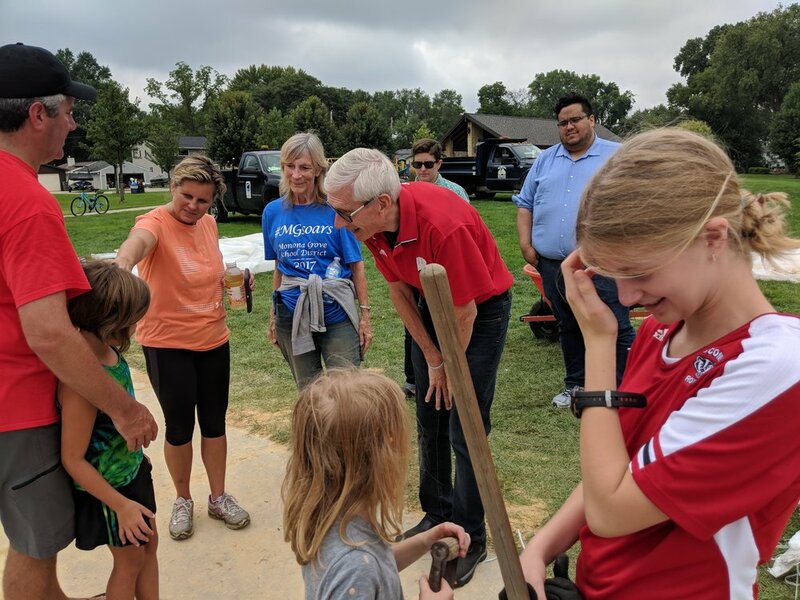 This week I attended Bean Feed, the fundraiser to support the South Central Federation of Labor, the umbrella organization that organizes and supports local unions, and working people of Wisconsin. Continuing with supporting working people across the county, I attended the The Building & Construction Trades Council Workshop, whee we heard from many long-time supporters of training, fair pay, and benefits. One of the cutest celebrations -- Los Niños Primeros the preschool program at Bridge LakePoint Waunona will graduate on Thursday. MG21 Students will also celebrate their graduation on Thursday evening at the Monona Community Center. Health and Human Needs met on Tuesday, May 15 at the ADRC. We heard from department leads who focused on the transition to family care, health care for adults overseen by the state, rather than the county as was previously done. Following the meeting we toured the ADRC to learn more about aging & disability resources in Dane County. At the ADRC there is a quilt with a square for each of the communities in the county, Monona's features a the Tonyawatha Hotel, which according to some internet sites say it burned down in the mid 1890s. The linked video provides an overview of Wisconsin Counties. On Thursday, I started my day at the Fen Oak building for the UW Extension Committee meeting; two of our neighboring supervisors were elected as the chair and vice chair positions, Supervisor Stubbs (to our west) was elected as the chair, and Supervisor Williams (Cottage Grove) was elected vice chair. You can find the agenda here. Dr. Welch reported on a program that has been having a lot of success in teaching students healthy eating habits, cooking, shopping strategies, and leadership: 4-H Food Smart Families is also showing a lot of promise as a model for other programs. I also met with Director Laura Hicklin and Assistant Director John Reimer of the Land & Water Resources Department to get more information about lake levels, and generally gain a better understanding of water issues that impact District 24. Assistant Director Reimer shared that the best place for lake updates is the Lake & Water Resources Lake Levels & Information website. You'll also see a weekly update that keeps you informed about the most recent conditions. He did say that the lake levels are very high right now given all of the rain that we've received. Director Hicklin explained that with a few very short periods a couple of years ago the locks have been wide open for a very long time, allowing the water to exit as quickly as our topography allows. Reimer went on to explain that part of the slow moving water is due to the relatively low difference in elevation across our system. Additionally, Lake Monona rises more quickly because of it's size and watershed size. One of the things we can do in our everyday lives to slow the pace that the lakes rise is to install water collection barrels which collect rain water which then slowly re-enters the water system. I don't have these installed yet, so I'd love to have some advice from any of you that are experts! We also talked about the boat cleaning stations and public announcements that share best practices for reducing the spread of invasive species. If you have your boat out on the lakes visit the website to learn more. You may also meet a friendly education staff while you're on the lakes this summer that can help you learn more. Thursday evening, we will host our first county board meeting since the swearing in meeting. You can find the agenda here, and all board meetings are live-streamed, if you would like to watch from home. I will have updates on all of these events in next week's post. Friday, I attended the United Way's Building Economic Stability Mobilization Team meeting where I learned more about housing insecurity in Dane County and how we might play a role in helping to create self supporting families—beyond the $15/hour movement. Coincidentally, a program connected to the United Way discussion held earlier in the day celebrated some big success. 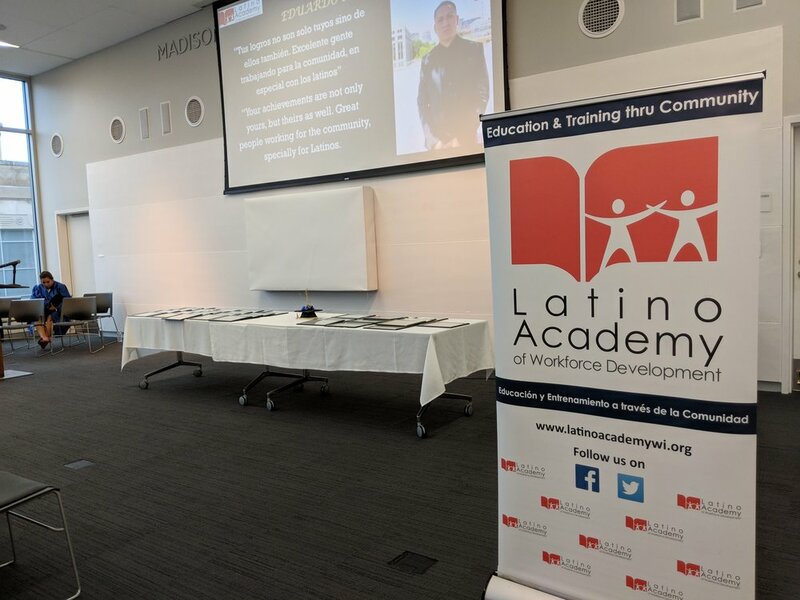 It was the graduation for 2018 Spring Bilingual Construction Graduates of the Latino Academy of Workforce Development—a program within the Vera Court Agency. The graduates ranged in age from 18 to late 40s, and were working on filling out applications as we ate. We were then given a tour of the work they did over the last several weeks in the program. The program is a win-win for everyone involved, from the construction partners, to the graduates, their families, and the instructors. In other news, my daughter was very excited to learn while we were out on our bike ride that the pool has water! Not long now, and it will also be full of kids making summertime memories. I've spent the weekend working for my day job, attending the workshop TRELIS. It is intended to connect female leaders in GIS Higher Education. It has been incredibly inspiring and I'm thankful for the opportunity. On Monday evening we will gather for a community meeting for the shooting that occurred on Bridge Road last week. If you are interested sharing concerns or input, the community will gather at the BLW Neighborhood Center with Madison Police Chief Mike Koval, Captain John Patterson, Madison Alder Carter, Dane County Supervisor Shelia Stubbs, and Monona Shores Staff. Wednesday, May 23, join me in supporting Wisconsin workers at the South Central Federation of Labor 57th annual Bean Feed. You can rsvp at the facebook link. The Bean Feed is a fundraiser for political education and member communication. On Thursday, May 24th at 5pm you can join me at the Steamfitters Local 601 Address: 6310 Town Center Drive, Madison to attend, Building a Strong Economy. You will learn more about the challenges facing the hard working women and men of the Building Trades Unions. This week we continued learning more about what Dane County oversees, I participated in the MESBA hosted EDGER meeting, a state-wide workshop, and celebrated mother's day with the community. The week began with several supervisors joining Sheriff Mahoney on a walk-through of the jail, something I had done before the election, as well. I will continue to observe and listen for all county services in the next two years to be as well-informed as I can be. I encourage you to share with me aspects that you think are important for District 24 that you may be engaged in. Supervisor Pertl and I attended the Lake Edge Neighborhood Association meeting on Wednesday at Pinney Library. Watch for upcoming events, including the Rutabaga Outing, and garage sale days. We met in the community room where we were able to take in the art of Jerry Jordan, currently on exhibit. I participated in the Economic Development, Government, Education Roundtable, along with other elected officials, city staff, and business leaders. The event is sponsored by a local business, and coordinated by Monona East Side Business Alliance, Executive Director, Kristie Schilling. Over the weekend, I drove up to Stevens Point to attend the Wisconsin Progress Institute Workshop. This was an invaluable experience in my continual growth and development as an elected official. I met with supervisors from other counties, and alders/trustees from cities/towns/villages around the state. We talked about ways to coordinate efforts state-wide, driven by local government to hold state legislators accountable on the Dark Store Loophole -- because we believe in big box stores paying their fair share, not shifting the burden to hardworking residents. Alder Kitslaar, of course, has been been a big advocate for this in Monona, and I look forward to continuing to support his work and a dedicated group of residents. If you'd like to get involved, please reach out. I hope you all had the opportunity to appreciate the mothers in your lives. I celebrated on Friday night at the Bridge LakePoint Waunona Neighborhood Center, where the Los Niños Primeros program participants performed a dance, and a delicious meal was served to a standing-only room. On Sunday, we made cupcakes at home and delivered them around town to moms in our community that we found to be home! This week is shaping up to be very busy. Health and Human Needs will meet on Tuesday, May 15 at 5:30pm at the ADRC; the agenda can be found here. Following the meeting we will tour the ADRC to learn more about aging & disability resources in Dane County. On Wednesday, I will attend 2018 County Officials Workshops (COWS) hosted by the Wisconsin Counties Association, University of Wisconsin-Extension Local Government Center. The workshop is intended to help all county policy makers "learn from experienced educators about best practices and avoiding the pitfalls of governance." On Thursday, I will attend my first UW Extension Committee meeting; agenda found here. 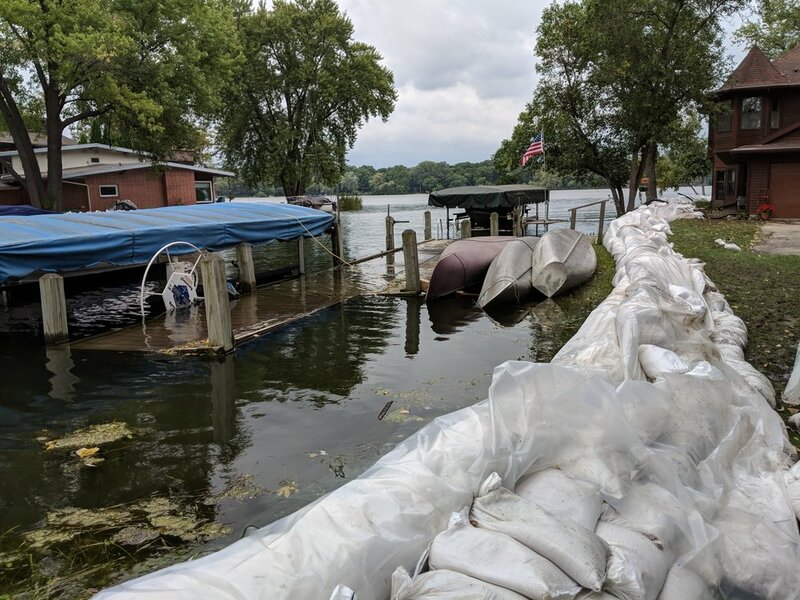 Following that meeting, I have asked Director Laura Hicklin and Assistant Director John Reimer of the Land & Water Resources Department to meet with me to explain more about the concerns coming our way with regard the high rains we've seen this year, and the impact on Lake Monona. I encourage you to send any questions or comments to me, either by email (buckingham.tanya@countyofdane.com) or fill out the contact page on this website. Finally, on Thursday evening, we will host our first county board meeting since the swearing in meeting. You can find the agenda here, and all board meetings are live-streamed, if you would like to watch from home. I will have updates on all of these events in next week's post. A little bit about process regarding Dane County Board work... About one week after taking the oath of office we received our committee assignments; I mentioned last week that I'll be serving on Health and Human Needs Committee. Agenda, minutes, and meeting times can be found on the county website, linked above. We had our first meeting last week. The Department of Human Services provides a tremendous amount of service to Dane County residents. I will share here what I learn and encourage you to contact me to add to my learning. At the highest level overview here is the Dane County Budget in Brief. What is reinforced time after time is how incredible the County staff is, Director, Lynn Green, provided us with a careful overview and explanation of processes. On Friday, May 4 we submitted requests for commissions, boards, and committees that the County Executive, Joe Parisi, assigns. Chapter 15 assignments are made by the County Executive and then they go to the Board for approval. Appointments are made based on availability, need, and preference. Another exciting event occured on Friday, May 4, Univercity Year Dane County partnership celebrated with lightening presentations of student work and posters displaying projects that resulted from the partnership. Paul Robbins, Director of the Nelson Institute described the year-long partnership, as "the beginning of a conversation." This week provided a lot of opportunities to be out and about, here are a few. Where will you be this week — let me know so we can catch up! 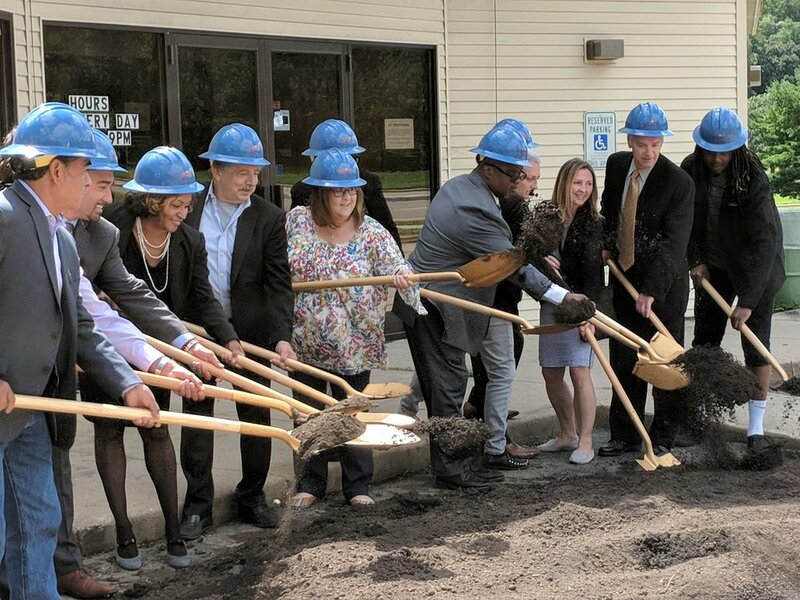 Kudos to all of the people who have worked so hard on the Monona Riverfront project, Monona City Council, Mayor O'Conner, Monona staff, CDA committee, and community partners. Thanks for inviting me to participate, even as a newcomer! Bridge LakePoint Waunona (BLW) hosted a fundraiser, with donations going to fund the summer programming at BLW. It was a great community event, with live music, good food, and a visit from the fire department for the kids to tour the truck. I caught up with several members of the County Board, and County staff at the Wisconsin Women In Government Gala on April 25, where we listened to Samantha Power talk about her time as a UN Ambassador, and challenge us to be what we didn't think we could be based on what this point in time in human existence calls for. Our first Health and Human Needs Committee meeting will be held this Thursday, May 3 at 6:30 at the City County Building. This Friday I will attend the UniverCity Year, Dane County Celebration to learn more about the outcomes of UW–Madison students, faculty members research. Last week, I was able to attend the Monona East Side Business Alliance Expotential Event to meet local business leaders, along with County Executive Joe Parisi. 37 Members of the Dane County board were sworn in on Tuesday, April 17, 2018. 7 members took their seats in the City-County Building for the first time. Supervisor Corrigan was re-elected as the board chair, Supervisor Dye as the first vice chair, and Supervisor Pertl as the second vice chair. As luck would have it, it was my turn to provide the inspiration to start the meeting. I was grateful to have a chance to talk about my inspiration for serving: heart, passion, and foundation. You can watch the entire meeting at this link. Each Supervisor is assigned one standing committee out of: 1.) Zoning and Land Regulation, 2.) Executive (county board chairperson, the first vice-chairperson, and one member from each of the standing committees), 3.) Personnel & Finance, 4.) Health & Human Needs, 5.) Public Protection & Judiciary, 6.) Public Works & Transportation, 7.) Environment, Agriculture & Natural Resources. On Friday, I learned that I have been assigned to the Health and Human Needs Committee. The mission of HHN is what inspired me to run for county board, and I am eager to get to work with my colleagues. I also look forward to serving on the UW-Extension Committee, and learning more about the ways the UW-Extension has helped county supervisors host engagement/listening sessions in their districts. This week I am looking forward to learning more about the County Executive's appointments and where I might best serve the county and District 24 well.